For directions, click on the link to the left. For more information about the inn, read on. The records of the land tell us that it started out as a farm owned by the Lennon family. The deed starts at 1854. According to the local census at some point (circa 1865) they started taking in boarders. Eventually, the Lennon family moved the farm house down the way and built the inn, calling it The White Sulphur Springs House. It was discovered that the water on the property was quite refreshing and had theraputic healing properties. A bath house with a doctor and nurses were added. 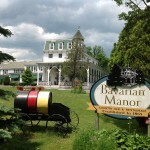 Through the years, the inn changed its name to The Columbian and changed owners about 3 times with our family (The Bauer family) taking ownership in 1931. Each generation has put their mark on the inn. 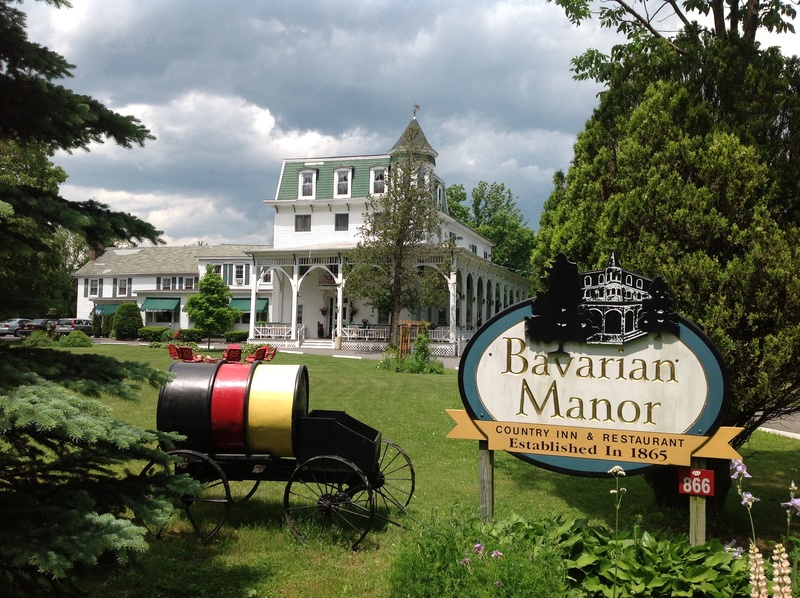 Karl & Anna Bauer changed the name to The Bavarian Manor, added on to the inn and actually turned the bath house into a German beer garden with music and dancing! Son, Bill and wife Johanna, made improvements to the inn and continued to create a lively, happy, friendly hotel vacationers looked forward to. The next generation, Suzanne with her husband, Stan, took the hotel to yet another level, looking to the past and celebrating the legacy of the Catskill Mountains, bringing the mountains, the art, the quiet, the air and the original hospitality together. Our rooms are… as other persons have said …”So unexpected!”… “They’re lovely”…”I love how each room is different…” “we feel right at home here.” All our rooms have their own private bath, cable TV an a/c., in-room coffee, irons, hair dryers and all but the “cozys” have small in-room refrigerators. And don’t forget about the jet bathtub and fireplace rooms. We’re pet-friendly! Check out our pet policy! Our food is delicious…. being an extern teaching kitchen for a number of local culinary schools, such as The California Culinary Art Institute, SUNY Delhi, SUNY Cobleskill and the Culinary Arts of America certainly tells you about the quality of our restaurant. Are we haunted ? Just a little. There is over 100 acres of country trails and a 6 acre lake with bass and catfish and if you’re quiet, you will see “Big Mama” a snapping turtle as big as a tire. We’re open all year-round. So you can walk the trails and fish the lake in the summer. As each season offers different activities, so do we, please see our current calendar of events. We are small and family owned and run. We’ve got some of the best views in the county. What other inn can boast a 40 mile view? Our east side 2nd floor rooms are our best, they book early. Our cozy lounge has a fireplace and opens to the porch. It’s filled with nice folks who love to share a few laughs and conversation. Occasionally we have live music in our restaurant. We’re not a suit and tie sort of place. We do get fancy, but dress-up casual is as far as it goes. We’re simple uncomplicated and friendly.. that’s our style! What can you do in Greene County and the Northern Catskill Mountain Region? Take a hike! We’re just on the edge of the Catskill Forest Preserve. There are close to 700,000 acres in this forever wild preserve with 98 mountain peaks. Have the best – hike The Kaaterskill Clove Experience ! Golfing…. America’s Favorite. There are 10 golf courses under 25 minutes drive from here. Greene County offers a great golf package! Woodstock, Howe Caverns, Cooperstown and Albany are easy drives and worth visiting. The Worlds Largest Kaleidoscope is a great spot and a lovely scenic drive. This Guinness Book of World Records holder is great for both kids and adults. 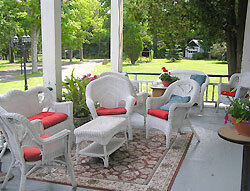 Come ski here in the winter at Ski Windham or Hunter Mountain, just minutes away. The Zoom Flume, the Catskill’s largest water park are a short drive. There are horseback riding centers, fun parks and go-karts an miniature golf courses. Every weekend you’re sure to find festivals and fairs. What else? Shopping…antiques… modern…country crafts… chocolate! Hudson, NY 20 minutes away, is one of the northeast’s greatest antique Mecca’s. Every week you will be sure to find an auction somewhere in Greene County. Scenic driving along our historic state roads offer some of the most spectacular views, there’s even a spot where you are able to see 5 states at once! And all along the way, there are lovely restaurants and shops to check out. Check out The Great Northern Catskill Mt. Beverage Trail – featuring craft beer and Hudson Valley wines! The Hudson River offers great tours. Travel up and down on huge paddleboats or rent your own! We’re just 10 miles away from the Hudson River! So you can see, there’s a lot to do around here! Or you can just relax and do nothing!